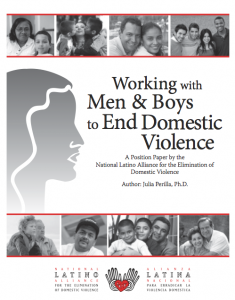 The National Latino Alliance for the Elimination of Domestic Violence (Alianza) has released a position paper titled Working with Men & Boys to End Domestic Violence. Written by Dr. Julia Perilla, this paper describes the principles with which Alianza approaches working with men to end domestic violence. Latino cultures, as do other cultures, contain values, beliefs, and expectations that can be used to justify, excuse, and even encourage domestic violence. At the same time, there are a number of Latino cultural traditions and values that support and celebrate respectful and healthy relationships that need to be emphasized and encouraged and that can be employed to help eliminate domestic violence using an assets-based approach. I appreciate how Alianza describes the role of prevention and intervention. Our work with men must be carried out at both the intervention and prevention levels. Thus, at the same time that we work with men who have used violence against their partners and children, we must also engage men who have stopped their violence and want to continue their journey towards non-violence, and with men who have never used violence and want to join the work of eradicating domestic violence from our communities. Click here to check our this position paper.